Quick rip induction at M.E.S.C. 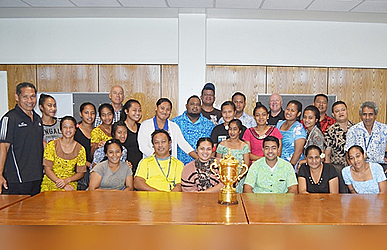 The Webb Ellis Cup made a quick stop at the Ministry of Education, Sports and Culture office on Wednesday where students of Vaimauga College and teachers from selected high schools were undergoing an induction programme on “Quick Rip” under the Sports for Health Program funded by the New Zealand Government. Quick-Rip is a fast, non-contact version of rugby developed and implemented successfully in New Zealand. 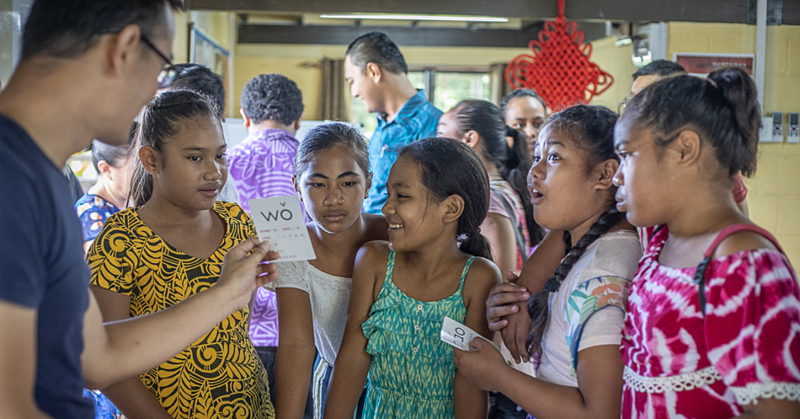 The “Quick Rip” programme will be launched officially at Apia Park this Saturday as a curtain raiser before the Manu Samoa v Flying Fijians PNC match. Samoa is the first of four Pacific Island countries in which New Zealand Rugby will roll out the programme. Anamarie Moala, Year 11 at Vaimauga College, who is playing in the curtain raiser this Saturday, says that rugby has allowed her to keep fit and that it compliments her Hip Hop group activities. “My family, especially my dad, has been really supportive of my rugby, especially as a girl playing what is generally a man’s sport,” Moala said.